What do you do with 45 lbs of locally grown organic San Marzano tomatoes?? Or maybe the question is better asked, what CAN'T you do? I've been shying away from canning tomatoes for a very long time. Most years, when the tomato harvest hits, I spend my time roasting up batches of delicious plum tomatoes and packing them into the freezer. You'll also find me busily dehydrating all of the Principe Borghese tomatoes we've harvested from our garden. But, canning? Not sure what it was, but for years I avoided canning. This year, I took it up out of necessity. Our chest freezer has been a savior for us when it comes to our ability to eat more locally all winter long. We pack it full of frozen fruit, vegetables, locally raised meat, soup, and homemade sauces. And we relish the days when we can pop it open in the middle of February to produce a container of fresh Wisconsin peaches, Door County Cherries, or spicy chili made with garden vegetables. Unfortunately, we've done a really good job of stowing things away in the freezer. And our freezer is getting full. The realization hit me a few weeks ago after clearing away just enough space for a new batch of late summer Amish chickens. We were out of space. Fortunately, I had cut my canning teeth on a few easy items last summer. Pickled & candied jalapenos, a few jars of tomatillo salsa, and a small stash of citrus marmalade gave me some confidence in my ability to create shelf-stable foods that wouldn't inflict us with botulism. So, this year, I decided to tackle tomatoes. More specifically, pasta sauce. I love a good homemade pasta sauce as much as anyone. But, I also have learned to enjoy the convenience of an occasional jar of store-bought pasta sauce for quick weeknight dinners. So, pasta sauce seemed like a pretty logical investment of our time and tomato money. Now, washing and coring 45 pounds of fresh tomatoes isn't a big deal once you put your mind to it. But, peeling and seeding them? Ugh. Not my idea of fun. And that's where a new favorite gadget of mine comes into play -- the West Bend Food Strainer & Sauce Maker. I should probably clarify that I'm not much of a gadget girl. I love the feeling of being creative and finding multiple uses for common kitchen tools. And my kitchen is pretty small -- so I don't have a whole lot of space for single-use tools. But, I'm pretty in love with this tool. This multi-use strainer forces food through a stainless steel screen automatically separating the juice and pulp from the seeds skins and stem. Best of all, it does it quickly and efficiently. And I mean quickly. And efficiently. To quote Peef, "I love it when I can seed and peel tomatoes with one hand while drinking a beer with the other." Once we got all that raw tomato pulp and juice extracted from the tomatoes, it was just a matter of cooking the sauce with a few herbs and spices (namely basil, oregano, thyme, cracked anise seeds, and garlic) and reducing it to the perfect pasta sauce consistency. 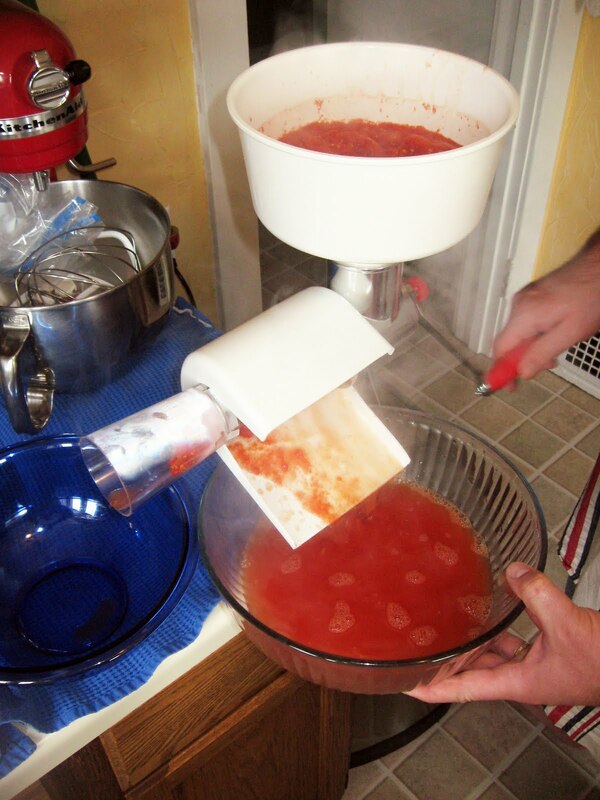 Once that was completed, we moved along to the canning and processing phase of things -- which is pretty methodical. Canned Pizza or Pasta Sauce ala Burp! And now for the fun part! We get to give one of our lucky readers the chance to win a West Bend Food Strainer & Sauce Maker of his or her very own!! For your chance to win, just leave us a comment sharing one of your favorite time-saving canning tips. Or, if you're not a canner, let us know how you'd use your food strainer to make one of your kitchen tasks easier. Rules: All comments must be received by Monday evening, September 12th, 2011 at 5:00 p.m. CST Winners will be announced on Facebook before the end of the day on Tuesday, September 13th. Entrants must provide a working email address in their comment or blogger profile to win. Limited to citizens of the U.S. and Canada. Full Disclosure: Although we were given West Bend Company products free of charge for the purpose of this review and giveaway, all opinions expressed in this review are our own. Boy would this have come in handy last weekend! I did not have patience for the food mill, which seemed to take forever for me to get through our tomatoes. And that doesn't count all the time I spent peeling said tomatoes! I don't really have too many canning time saver tips since I'm still learning my way through the process, but this West Bend Strainer & Sauce Maker would surely speed up tomato sauce production in the future! I have never canned anything really, so I'm of no use on canning tips. This food mill sure looks like it would be helpful though! I have yet to try any heat canning. I'm new at this and have been sticking to refrigerator pickles (beets, beans, zucchini, onions, cucumbers) and freezing. I think with this gadget I would put that wonderful pulp right into the freezer. What a time-saver that would be!! I seem to be canning the whole month of August and this WB Strainer & Sauce maker would have been great when I made my pasta sauce 2 weeks ago. I always plan the day ahead, wash jars and lids to sterilize in the dishwasher and on hot days like we've had this summer and to free up space on my stove, I boil my water for the canner outside on my turkey frier. It actually comes to a boil faster and keeps all the heat outside and saves a little on my a/c. I just spent hours processing 30 lbs of roma tomatoes. To peel them, dunk in boiling water for 1 minute, then dunk in ice bath and the skins will rub right off. The problem is the seeds are still inside--you can remove them underwater to help not have any stay with your pulp. At the end of the day, 30 lbs reduced down to about 5.5 quarts of sauce. A lot of work that the WB strainer could help minimize tremendously! This sounds incredible. And of course I could can things year-round out here in CA...and send them back to WI. My tip from my canning days (besides having beer handy) is the best investment for fruit canners -- a cherry pitter! Worked wonders to make pie filling and most importantly BRANDIED CHERRIES. I'd make all kinds of sauces with this! Pumpkin sauce, tomato sauce, all sauces! Oh this would have come in handy this past weekend! I think I worked my way through 40 pounds or so of tomatoes for sauce, not to mention the 17 for pickling. My only tip for saving time is to create "an assembly line" and plan thing out. So while I'm dealing with tomatoes, I'm getting the jars ready (that water bath canning pan takes for ever to boil). I could become a multi-tasking fool if I could peel, seed and drink at the same time! My favorite aunt made the best homemade can sauce. She supplied just about the whole family with her sauce. She pasted in April but not before she gave me her recipe. This strainer/saucer will make my job a whole lot easier. Want to save time? Create an itinerary for your canning plans. Very helpful for when you do multiple cannings in a day. Hmmm...my favorite time-saving tip with canning would be to have everything out and ready to go, all at once. Pre-wash and boil your jars and lids...get your salt and other necessities out and have it all ready to go at the same time! This year was the first year I have ever done any canning, so I don't really have any tips! I would LOVE to win that Food Strainer/Sauce Maker, though! I made 9 pints of salsa and it took a LONG time to peel and seed all those tomatoes! I would love to be able to can some of my own pasta sauce next year. I used to can, but now I mostly freeze my food. This would come in sooooooooooooooo handy for the 2 bushels of apples I just received. I see at the website that the screen can be used for apples too! I've never canned before but I'd love to try! I love canning and I think we're on the same brain wave...again! I just bought a bushel of locally grown San Marzanos and they're sitting in my kitchen right now. Sadly, I don't have an awesome device on hand like you so it will be a long and tedious afternoon. My favorite time saving tip is to have a time line for prep work and use the dishwasher whenever possible! For jars, even if I disinfected them earlier I give them another spin in the dishwasher with the rinse/disinfect cycle, and leave them there in the steam until I'm ready to pack. awesome! we grew san marzano's this year too. we smuggled the seeds in from italy a few years ago and finally have the room outside to grow them. did you grow them from seed? i don't understand why we can't make a domestic san marzano can of tomatoes here? every can i buy is imported from italy (usually) and about $3 a 16oz can. mine are almost ready to pick but i don't think i'll hvae enough to make as much sauce as you. go you! When I preserve tomatoes, I blanch the skins off and throw them into the freezer in plastic bags. I've never really tried anything that required removing the seeds. I'd love to try making tomato sauce; most canned sauces have added sugar or worse in them. I have made my own pumpkin puree, and it looks like that thing would work better than the food mill for juicing watermelon. I've canned only a few times and it's always been jalapeno peppers. No tips from me at this time. I'd surely use this to make berry jellies! I like having someone work with me in the kitchen. My 12 year old son want sto be a chef when he grows up, so last week we blanched and peeled 50 pounds of tomatoes together. I think this contraption would be very helpful. this is actually my first year canning. Last year I intended too but my family can eat a lot of salsa post haste! I want to get into canning, especially now that it is apple and pumpkin season. I hope to win to encourage me to start canning. Best canning tip, never touch a hot jar!!! I'd use this to start canning tomatoes (if my tomatoes ever turn red!). my best tip.... get help! the more the merrier, plus you can do it assembly line style. My tip would be to ALWAYS use a funnel (they sell ones designed for canning) so you don't get the stuff you're canning on the lip of the jar (which could compromise your seal). This would be a great way for me to start canning. I've wanted to, it just seemed like so much work. Best time saving tip I have is to cool/refrigerate your tomatoes ahead of time. When you place in a hot water bath the skins split in no time. Make sure to have your cold water bowl with lots of ice ready. This turns a long process of skinning into a relatively easy process as the skins just slide of the tomato. We do this all by hand as I find it's easier than doing knife work. Also remember, always have a clean spoon nearby for tasting. We constantly tweek our recipes each year. Oh and last! Get a good bottle of red wine to add to the sauce. It really kicks it up a notch! I have never canned before but want to start. I'd use the strainer when I started canning, and the first thing I want to learn how to do is home made apple butter. I would use this to make spaghetti sauce. I'm a beginner canner, so I don't have any tips, but this strainer looks like it could help me make spaghetti sauce! I've yet to learn how to can (would love to learn though) but this strainer looks like it would be a big help in making pasta sauces and various fruit sauces! I did 30 pints of marinara last week and this strainer would've been awesome!! Oh well. =) My fav canning gadget is an apple peeler...saves so much time!! I'd love to try tomato sauce too. THANKS!! I like using a hot water bath then cold water to help peel tomatoes & peaches. I'd like to try this with apricots. I love reading other time saving ideas and can't wait to try them out :) Thanks! This summer I have turned into a canning fool!! Now I need the gadgets!!! Love this post..btw! I would totally plant more tomatoes for next year if I had this! I love homemade sauce, it only for the lower sodium and sugar levels! I haven't canned yet, but my sister in law told me I'm going to learn how...and how to make jam...this year. I bet this would make my experience A LOT easier. I need all the help I can get! I would use this to make some of my son's baby food. I am not a canner although I'd love to learn! To preserve Roma tomatoes I have roasted them and frozen them for use in the winter. This tool would be great for making sauce and salsa! This looks like the ticket for making sauces. I love to can my own food. I am not a Canner, but my mother and Grandmother were growing up and i would love to start. Amy (we are never full) - we didn't grow our San Marzanos from seed, but we did find a source for them through our local food co-op. Would be eager to hear how yours produced this year! And... incidentally, you win the Strainer/Sauce Maker, so I'll be emailing you soon! congrats! I need to learn this stuff. I had to just write THANK YOU for this awesome prize. We just received it, opened it up like two kids at Christmas and are already planning on using the strainer/sauce maker tonight. We have some san marzanos and a boatload of habanero's that we are roasting now. Let me tell you how great it will be to not have to handle the habanero's with our hands (I'm sure our baby will be happy not to have his diaper changed w/ habanero oil on my hands!). Thank you to west bend housewares and to you guys. What a great win!